A few days ago I posted something about the Mahasiddha Tilopa's "Six Words of Advice." I may have not found the right words and continue to be fascinated by this sage advice and find it personally invaluable, so please forgive some further comments. 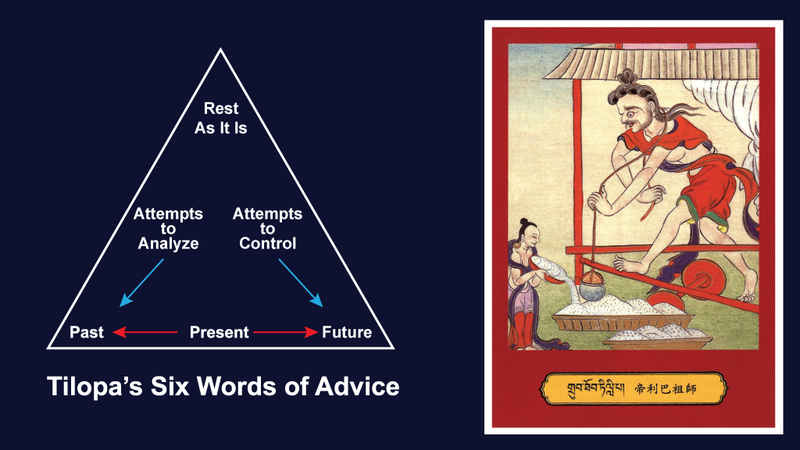 I actually find it helpful to be aware as to where my mind is on this little diagram of Tilopa's words of advice. And most of the time I am anywhere but where I would like to be. That is why these six words of advice are so helpful. Being reminded of what I am actually doing with my mind, even roughly, points out to me that I am usually, as they say, "Any which way but loose." And how is that? That is because I am easily distracted and prone to jump on any passing train of thought and take a ride, a ride that seldom goes anywhere I really want to reach. It just spends time and is at best entertaining. And it is a good thing that I like movies, because most of the time I seem to be watching one of my own projections and enjoying (or at least reacting) to it at that. This tendency is what Tilopa is pointing out. Tilopa suggests we allow the mind to just rest naturally, like we would when we sit down in a big soft chair after a day of hard work. It is not like there is a 'right' place, object, or subject to allow the mind to rest on, but there does seem to be a right way of resting, one that allows mindfulness and clarity to arise. In other words, this or that object or subject of focus (whatever we are thinking) is not "bad" (or "good") in itself, and negative attachment (revulsion) is no different from positive attachment (love and like). Attachment is attachment. Buddhist fundamentalism would be no different from any other kind of fundamentalism, dividing the world into good and bad, subject and object, and so on. That is not what the dharma intends. Tilopa points out that it is best not to dwell (be attached) to the past, present, or future, although they are all equally attachable. By that same token, what Buddhists call the "Three Times" (past, present, future) are all equally workable. We can start where we are. There is no need to run to them or from them. Just relax and leave them be, just as they are. Tilopa suggests that we "let go" of the three times, not to deny or shun them. Thoughts of the past, present, or future are all just that, thoughts. We are advised to become aware that we have become attached to thoughts and to just let go of the attachment and rest in the ensuing flow. In more advanced meditation practices, practitioners are taught not to just look at the content of a thought (the train of thought), but instead to look at the nature of that thought, and the most remarkable thing is that all thoughts share the same nature. Once we have seen and realized the actual nature of one thought, we have done the same for all thoughts, past, present, or future. But this takes time and practice. Tilopa suggests not to prolong the past, invite the future, or think about the present, but his message, as mentioned, is about not becoming attached or carried away by thoughts, like getting on our train of thought and taking a ride without being mindful that we are doing just that. This is a method to wake up. When Tilopa says let go and 'rest as it is', that rest is beyond attachment of any kind to the past, present, or future. We let go of that once we realize that we have become attached. For example, if we find ourselves prolonging the past, trying to figure it out, etc., Tilopa does not mean for us to somehow get out of the past and into the present or future. Not at all. In fact, there is no particular place to go, as Chuck Berry pointed out. He means to let go of our 'attachment' to the past and just rest as it is -- however it is in the moment. Past, present, or future makes no difference. The three times are identical in nature and are not sources of refuge for us. Attachment itself is not somehow evil or bad by nature. Attachment to anything only distracts and obscures our true nature, which is why Tilopa suggests we let go of attachment to the three times and just rest in the true nature of the mind itself, which is something we can learn to do. He is showing us how. For me these six words of advice serve as constant reminders for me to realize and locate my attachments and reactions, relax my hold on them, and learn to just let them go so that the mind can clear. I find that this is a process that I can gradually learn to do all throughout my day, not just in formal sitting-meditation practice. The amount of time I allocate to sitting-on-the-cushion practice is nowhere near the time I can spend in this particular practice that Tilopa suggests. There are few dharma practices that I have come across that are as easy and simple as this one. Anyone can do it. I realized early on that going to church on Sunday for one hour or so would never be enough to get a rascal like me into any kind of heaven. It would take real practice time for me to realize much of anything. Tilopa's six words of advice are an easy opportunity to accumulate real practice time, like: all day long. It is, as they say, a no-brainer! I include here Tilopa's suggestions for those who may have missed it the first time. The card image is one of Tilopa grinding sesame seeds. Some interaction on this would be welcome.